Renders all other fanfolders for digital printers virtually obsolete. Includes internal loop control and patented size change features. Also available as a job separator. See article for additional information. 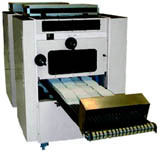 Options include: pinfed, pinless, book offset, three- up, two- up, merge, sheet insertion.